The prominent drawing of Lhuiller is the base of all the things. It was he (later with Erich von Däniken), that brought the truth to the daylight. Nobody but he manages to produce such attention like "Ah" and "Oh". I dont want this contribution on no account to criticise his drawing. But Dr. Lhuiller lived in another time so things did not look the same as today we clear I y realize. My objection directs itself exclusively at the nose of the spaceman. The sarcophagus depicts very clearly a protection of the nose like a fighter pilot. Lhuiller is thought to have assumed that the stonecutter has not made something correctly, and so the whole nose in its drawing is depicted. And this nose on the gravestone is invisible below the oxygen supply of the protection of the nose. This nose on the gravestone is invisible below the oxygen supply of the protection of the nose. To better explain I have got the protection of the nose of the air force fighter pilot to look at, then recognize the unanimity with the sarcophagus, and the small, well meant error of Lhuiller. The foot-controls of this primitive "space rubber boat"
Thanks the prominent drawing of Lhuiller the graphical processing is very simple. On can illustrate much easier in colour. One sees in this image, the spaceman directing the jet with his naked foot. This spaceman controls like a racing driver, without any electronic or electrotechnical auxiliary resource. But at that time already easy electronics had, portend already the earplug up different tiles. So can it itself here even about a sporting pidgin deal. Probably but not. With different colors I can explain better. Especially what I see from this figure. The guide of the feet must be supported for the long leverage (axis of pilotage for the feet), then the thrust control can the thrust of the gas divert and can be accurately adjusted with the long axis. To better explain, I have got the aircrafttail of a airplane to study. This thrust control has the same operation. With the exceptional design from Dr. Alberto Lhuiller, reworking the graphics with colour are very simple. But in the design of Dr. Lhuiller, the astronaut seems half naked. But, in truth - on the plate of the sarcophagus - he is very well protected from the cold. But the hands and feet are barefoot, in order to drive more accurately with the capsule guide. What underlines my theory of "primitive technique." The small "seat" is certainly a little obstacle, but in this case should not be impossible. Do not forget that our chemical "rockets", with a human crew, have the values of acceleration of approx. 60 m/s2 . This small space capsule, however, has presumably an maximal accelleration of approx. 15-20 m/s2. This would allow this seemingly impossible seat. And now we colored the entire drawings. Even here, as the basis, the famous drawing of Dr. A. Lhuiller. If you are piloting with your feet and sitting on a very simple chair, then somewhere you need to really hold fast. Possibly, the knob integrated into the handle for the left hand, serves to adjust the propulsion. The small button adjustment, which is used in the drawing, is probably the volume button or to search for radio channels. But of course, it could be something else. High Tech I can not see here! Most likely, bottom left of the chair. As in a motor vehicle! To laugh. But we must really be crazy to be piloting a spaceship so. But here we can see clearly and unambiguously that the facts are these. Long axis of leverage for the feet, short axis for the directional wing. Very beautiful is the ergonomic support for the left foot. It has even a single regulating screw. Now, if we look at the long levers, then they must be "supported" in the middle of their route. Otherwise will the entire frame rattle apart. This suspension however, must act on 2 levels, given that the gas thrust should be able to "fly" on 2 levels. Otherwise flies only left or right. If you look good throughout the structure, then you have the sense to stay in front of an object made in the garage. Surely nothing exceptional. The only thing exceptional is the engine. Really unique. I described below. This madman has courage, to fly with this "thing". Note: Wanting to see the fruits on this technical drawing, that requires a vivid imagination. We're beginning with a different explanation. Tanks for liquid combustion, compared with very heavy tanks of gas. I would say that if the weight of gas amounted to 100 kg, then are the empty tank amounts to approx. 100 kg (depending on the gas pressure of course). For a tank of liquid fuel instead, for 100 kilograms of liquid, serves only an empty tank of approx. 5 kg! In addition, a engine powered by gas, develops much heat. This then must be disposed of through a very heavy cooling system. But that weight does not want to bring him up. 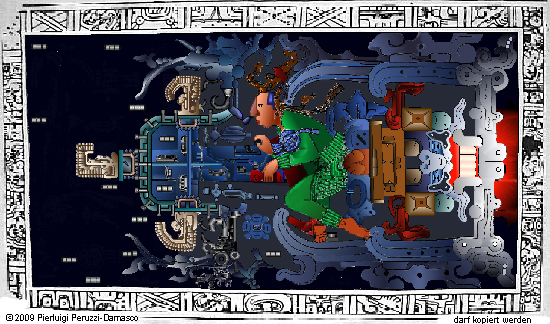 If you compare pictures of the sarcophagus of Palenque with diagrams of a modern engine, then you realize that there is almost nothing in common. The engine of Palenque IS NOT a engine type of "von Braun." Therefore we must forget actually space technology. You can see from this draft, the shear flow of the engine of Palenque goes out parallel. With this I would say that the strength of thrust vector runs - compared to our engine type von Braun - almost 100 percent in the right direction. This means that we need much less propulsion and so can also save the less weight of having to carry fuel. This engine is powered chemically as ours, but was planed under completely different circumstances. That compared to our current propulsion type "von Braun". The strong pressure in the combustion chamber is an obstacle to the new power of fuel. This requires strong turbine pumps. This also adds to the weight. In part the strong pressure has become heat rather than thrust. This requires a heavy cooling device. This also adds to the weight. The strong pressure in the combustion chamber requires heavy walls of the combustion chamber itself, which resist this pressure. Again, this also adds to the weight. Here you can see clearly the 2 "jerry cans" which should serve as reservoirs for liquids for combustion. The genius of this engine is based on the principle that the gas propulsion goes out parallel. Our thrusters today have a degree of effectiveness of approx. 30 %, but this engine shows a degree of effectiveness by over 90%! The liquid fuel flows from the tank through the conduct L1 directly in the piston pump. The liquid is put under pressure in the piston pump 120 bar should suffice. After the fuel flows through L2 under pressure in the evaporator compartment. These are located in the lid of the combustion chamber and the fuel evaporating through the heat of the thruster. At the same time the evaporation cools the cover of combustion chamber! During the evaporation in the chambers of evaporation a pressure of gas from 8 to 10 kg/cm 2. This is not enough to "go back", but enough however to push the evaporating fuel into the combustion chamber. In the combustion chamber itself should develop a media and constant pressure "upwards" from 4 to 6 kg/cm 2. This is not easy, then everything is under open! As the gas is pushed straight through the cylinders and can not disperse all, it should be possible to develop a strong enough pressure on the lid of the combustion chamber. The opening output engine should be round and a diameter of 40 cm. From this resulting 1250 cm2. If then developed a constant pressure of 4 kg/cm 2 in the combustion chamber resulting a total pressure of about 5000 kg! (of course only if a degree of efficiency achieved of 100%, but that is not realistic). But, already with 3000 kg of thrust the little spaceship should fly up well! In the coming days will try to solve the chemical problem. Because I not are chemist and will have to go and ask. If you examine this design, everything seems as if they are front of a "space suit capable of flying." This means a space suit with rocket engine. For over 3000 years we knew space navigation on earth. At this point I want to finish my theory on "The madman of palenque". A nice ciao to all.